Urban surfaces communicate with the inhabitants. Spaces become immersive environments. Exhibitions respond to their visitors. 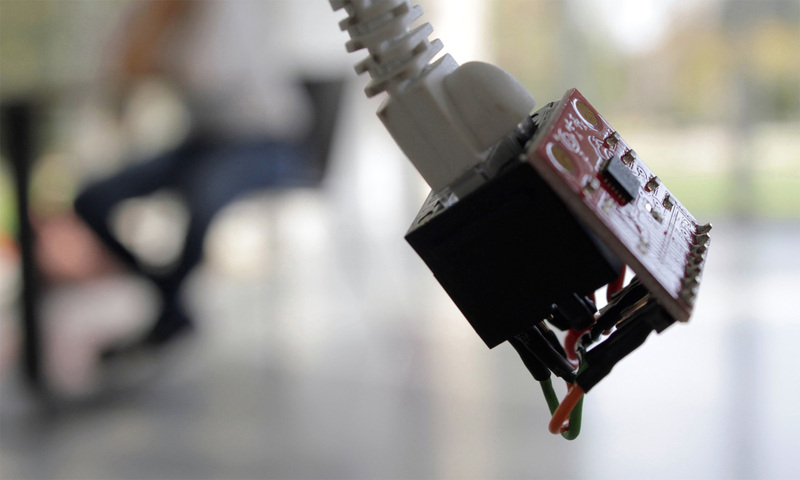 The user gets full control over the built environment via specially programmed devices. On- or offline. With proprietary software or open source. Some paradigmatic interactive machinery shall be shown here in this brief overview. They were developed in different constellations. The links provided lead to further details and full credits. For a complete list of works, please refer to richdank - the complete story. How can complex information - as it is produced in climate research - find its equivalent through sounds in a microclimatic exhibition space? 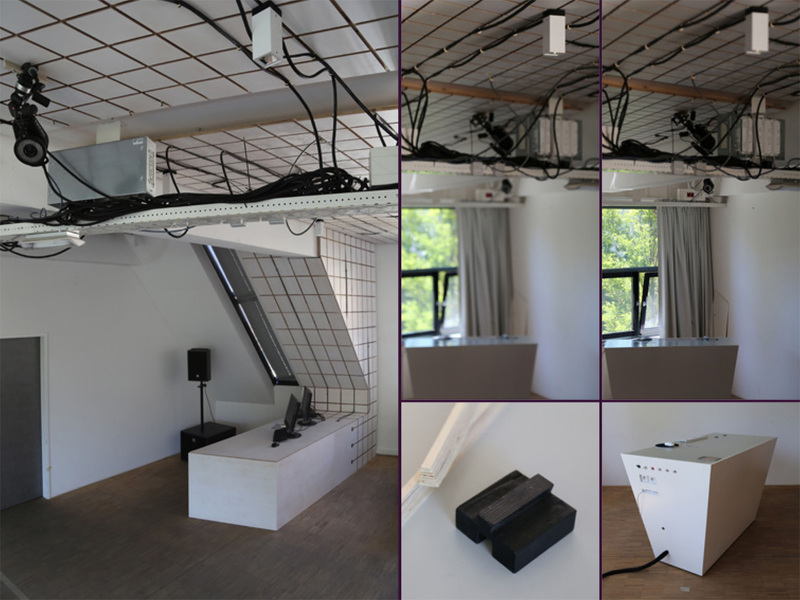 This project was developped in close collaboration within SysSon - a systematic procedure to develop sonifications. So far, researchers have focused on simulating prognoses and creating visual representations. In the process the data space emerges out of a net that is stretched over the globe and is monitored during a very long period of time. Yet, this venture wants to make that heap of information sensible using another dimension: hearing. 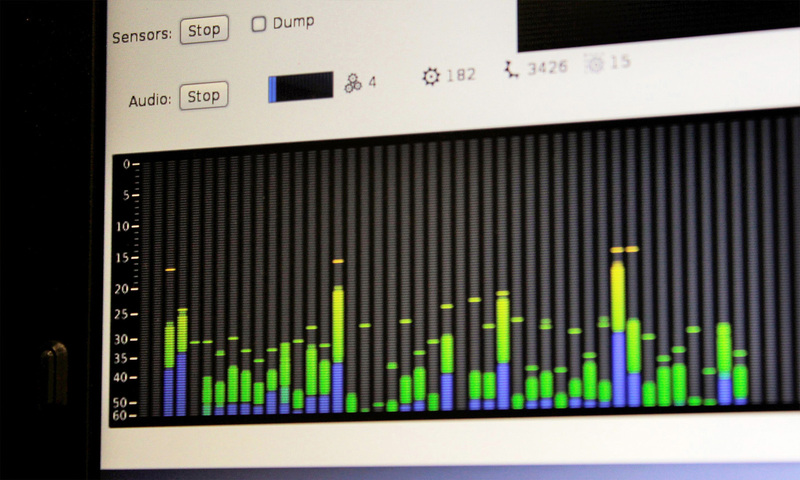 The results collected are translated into sounds, this means: the data becomes audible! 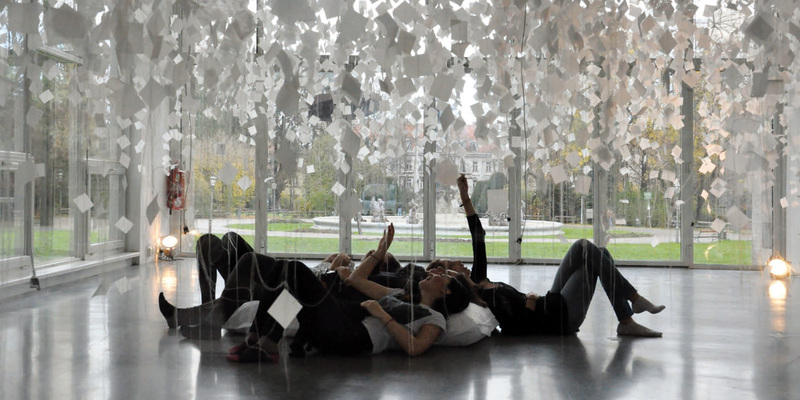 The task was to create a spatial atmosphere and a sensorial interface to 'display' the sounds and to interact with them. 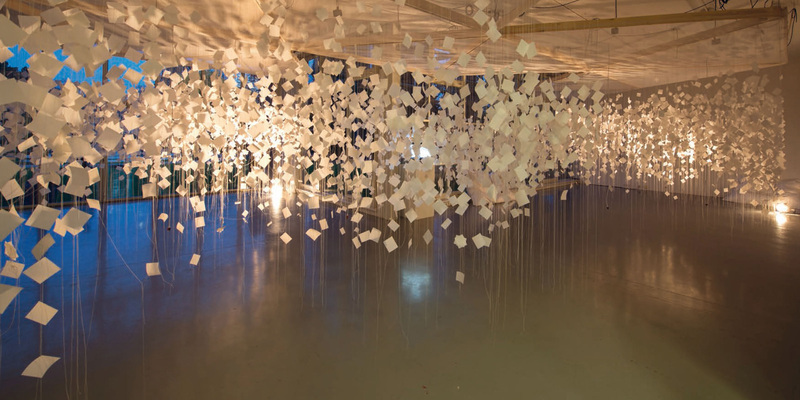 The immersive setting includes sensors that transform the impulses triggered by visitors via modulation of the data sets into new sound patterns. 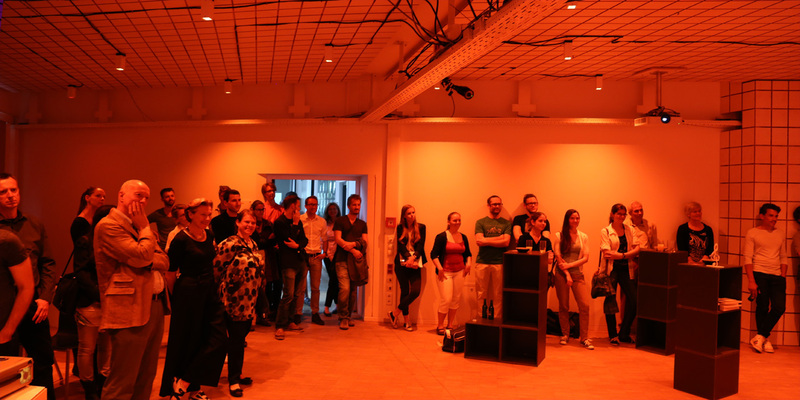 The final installation was presented in an interdisciplinary exhibition in the Forum Stadtpark, aiming to make this particular research tangible for a broader audience. 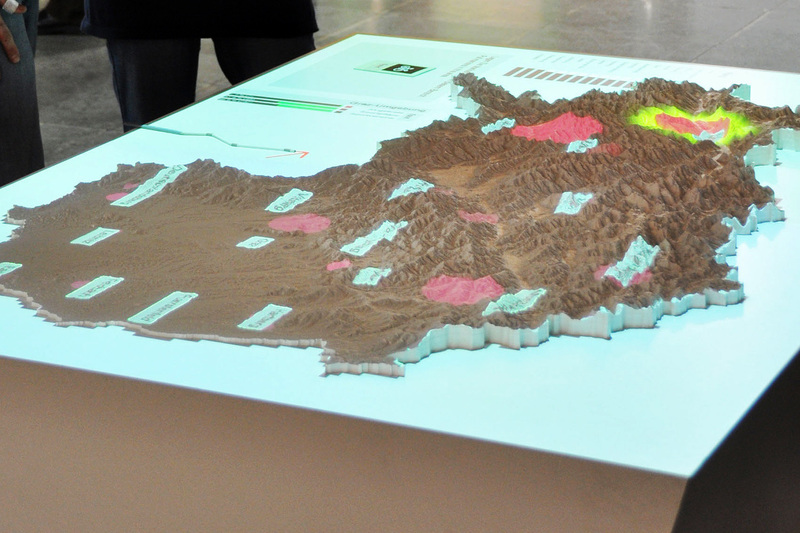 Top: Atmosphere in the exhibition, and sensing visitors. 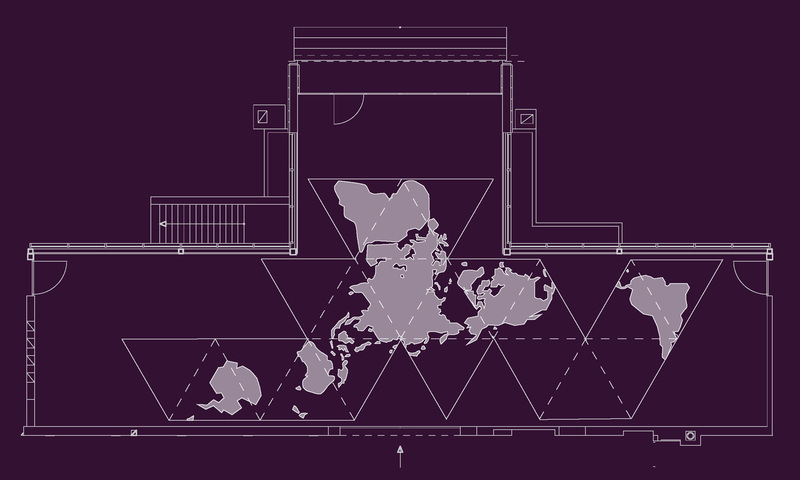 Below: A Dymaxion-like unrolling of the earth transposes the data of the world's climate into the Forum Stadtpark. 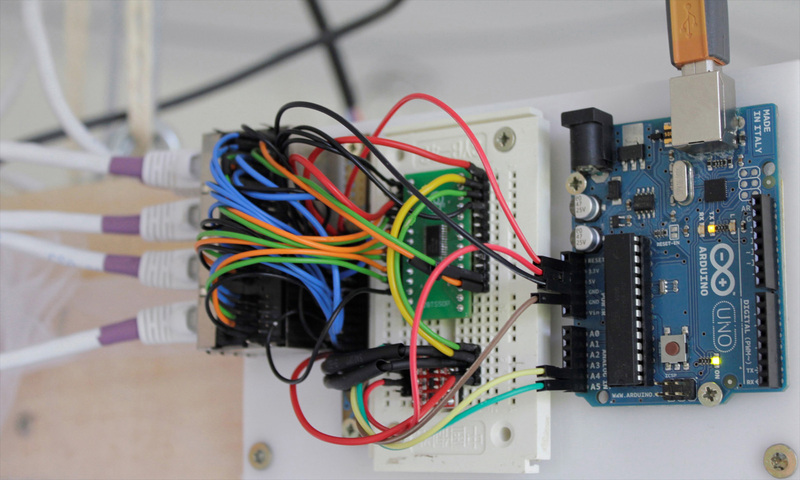 Following four images: Customized sensors, implemented with Arduino, Java-controlled application, 42-channel sound-output. 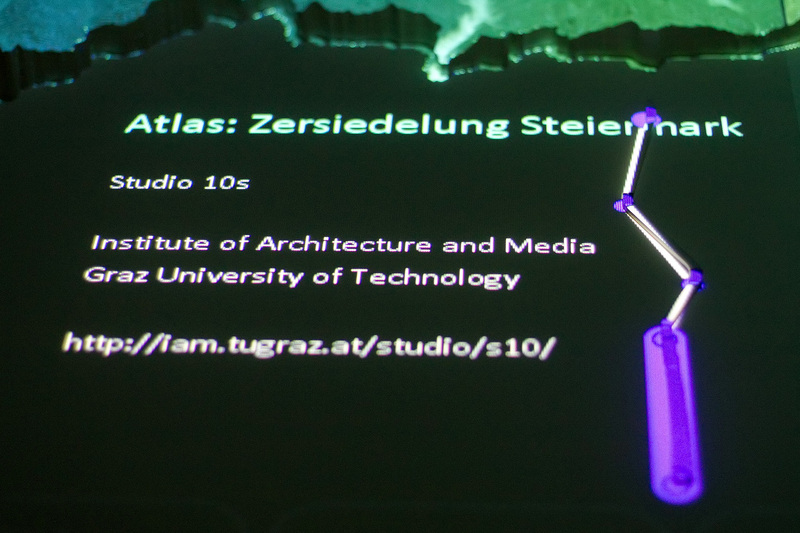 Above: The Augmented Architecture Laboratory on Campus Inffeldgasse at Graz University of Technology and the mobile desk as central control unit. Below: Different light- and projectionexperiments during the reopening in 2014. 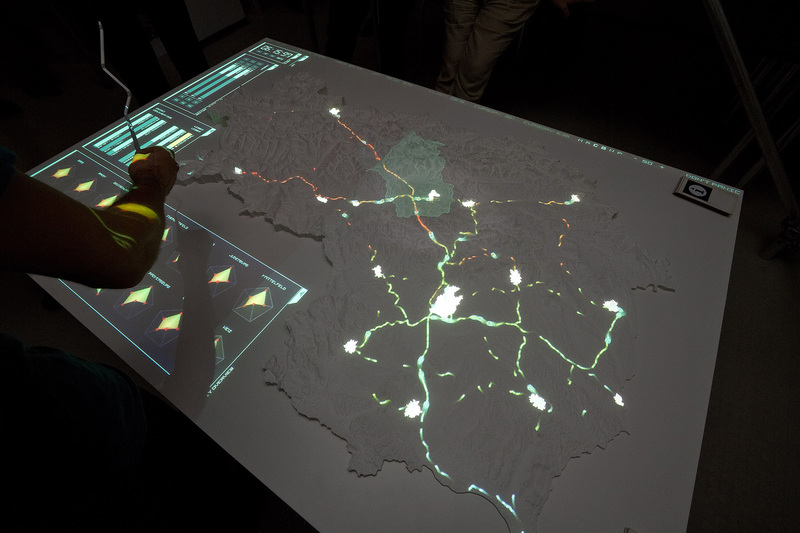 The new Augmented Architecture Laboratory can fulfill a wide range of standard prerequisites like lectures and exhibitions - while at the same time being adaptable enough to continue to allow for manifold experiments. 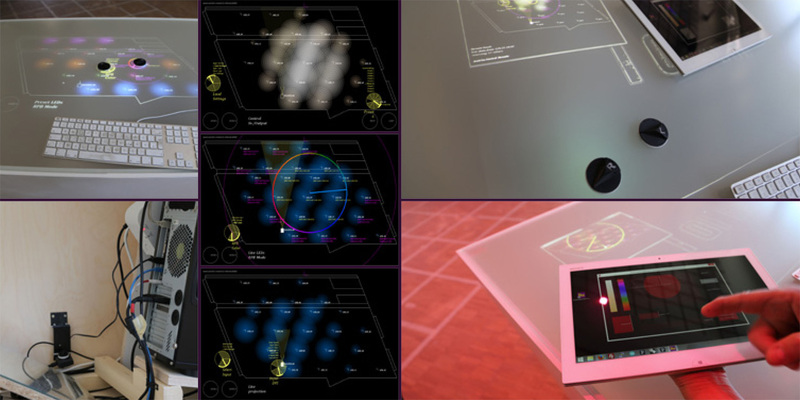 Diverse light and projection technologies have been implemented, along with tracking systems, immersive environments and other ways of digitally expanding space. 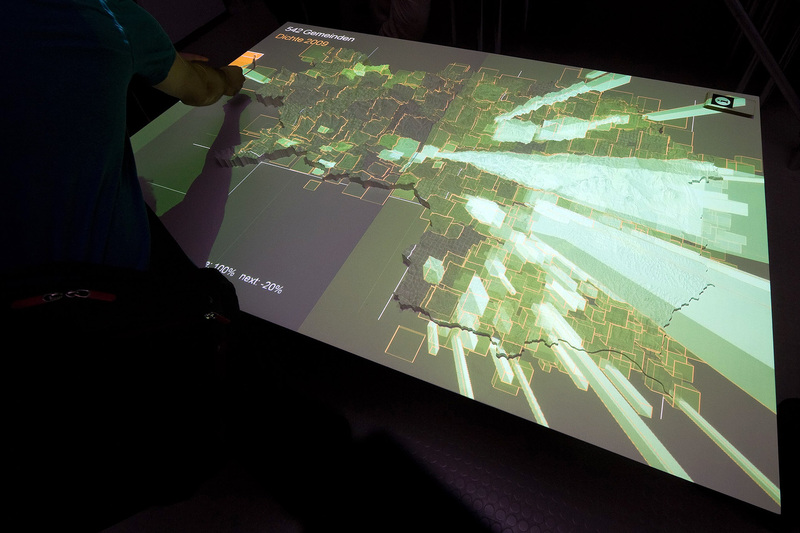 And all those installations are now controllable via an interactive table with an interface that accordingly needed to be engaging. An compelling, flexible and easy-to-use design was developed and implemented: make all the technology visible - staging instead of concealing it! 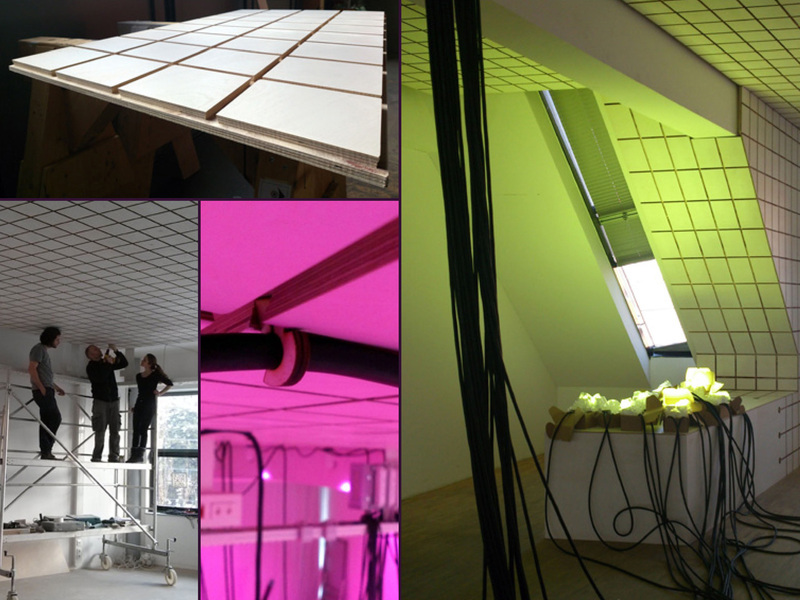 Once again cooperation partners from the industry were found: KITEO/LUMITECH, with expertise in the field of LED technology and the Engineering Center Wood/Holzinnovationszentrum, where the individual components were prefabricated. The AuArLa reopened during the festival celebrating the 10th anniversary of the institute. Above: The Opening with the first crowd gathering and interacting. Below: Two impressions from around the Kunsthaus Graz. Following two rows: Photographs taken at the Uhrturm on the Castle Hill. Bottommost line: One of the misused urban devices to trigger the BIX-façade's moving images. 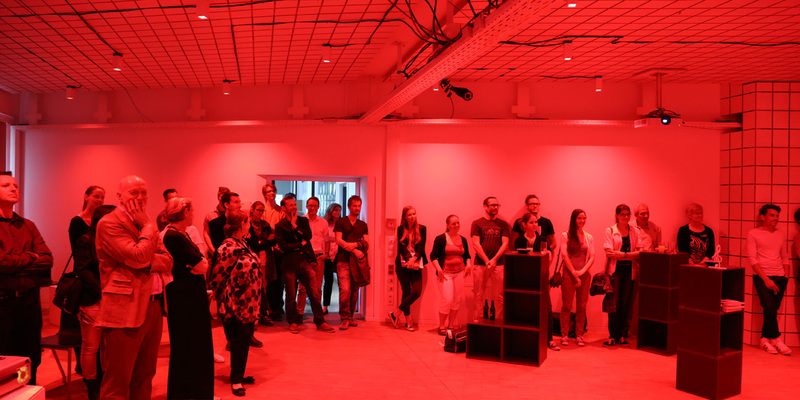 Commenting on different communication strategies between the public, the city and the Kunsthaus Graz, a group of students of the international master program Advancing Digital and Regional Interactions in Art Teaching (ADRIART) presented their findings/experiments on participation. Research was done about creative strategies on transmedia art projects that work with and in the public realm in its broadest sense. 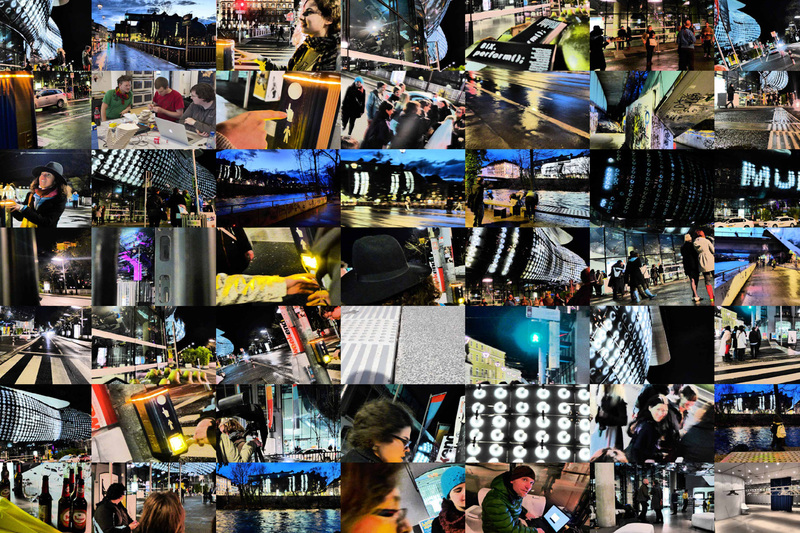 Finally four interactive performance pieces enriched the city's surface by interweaving the sensorial and spatial relations within the urban texture. 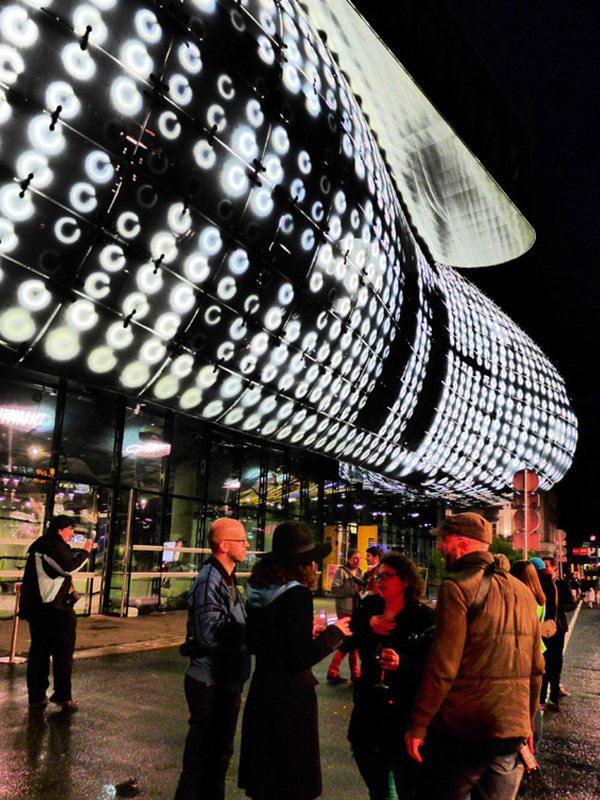 BIX is a matrix of 930 fluorescent lamps integrated into the eastern face of the Kunsthaus. The concept was initiated and developed in 2003 by realities:united for the architectural competition entry of Peter Cook and Colin Fournier. 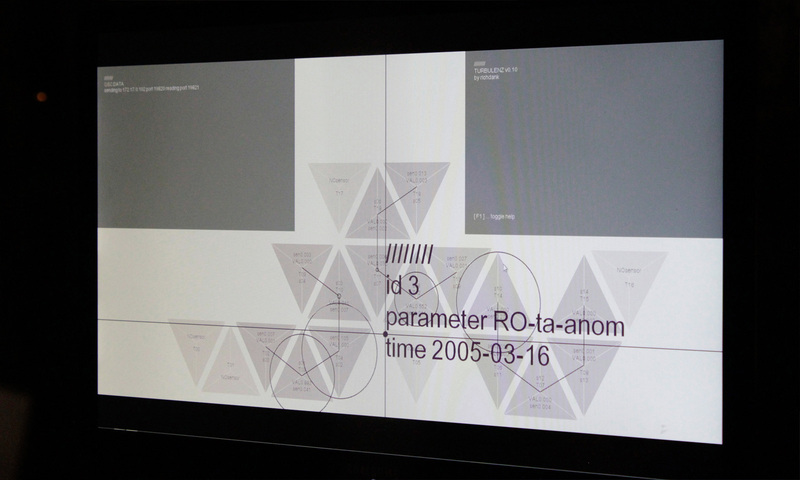 In 2013 - besides conducting the works - we created a new Java-based application, being able to establish a live connection from any device worldwide to the façade's MAX/MSP-based controller. Urban Sprawling is a well-known phenomenon throughout the industrialized world. For decades now these facts - with a manifold of associated problems - are uncontradicted. But for the greater part, regional development and urban planning are still heading into the wrong direction. However it is one thing to analyze all this on an academic level, and something completely different to make that clear to the rest of us. 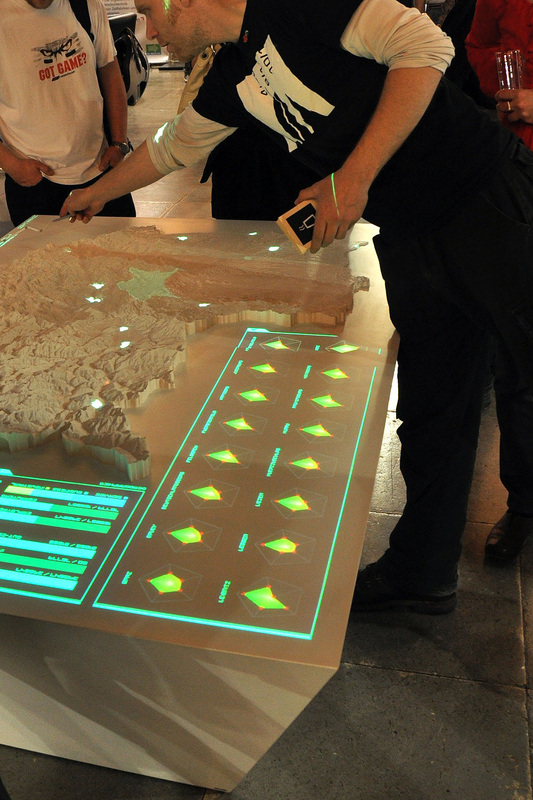 With two data projectors animated visualizations are superimposed onto a milled, topographic model. As input devices we introduced on the one hand a 3D infrared tracking system to detect motion. On the other, there is a video camera to register patterns and icons. Thus interaction via hands, objects and cards is made possible. 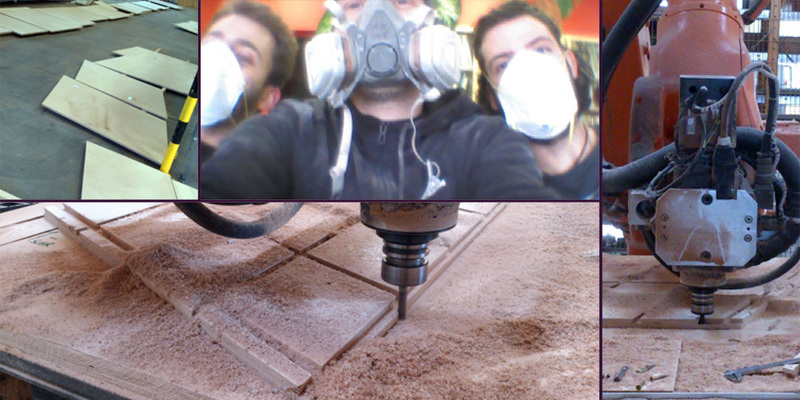 First four images: Photographs from the Augmented Styria Desk and the 'magic wand' to control the unit. 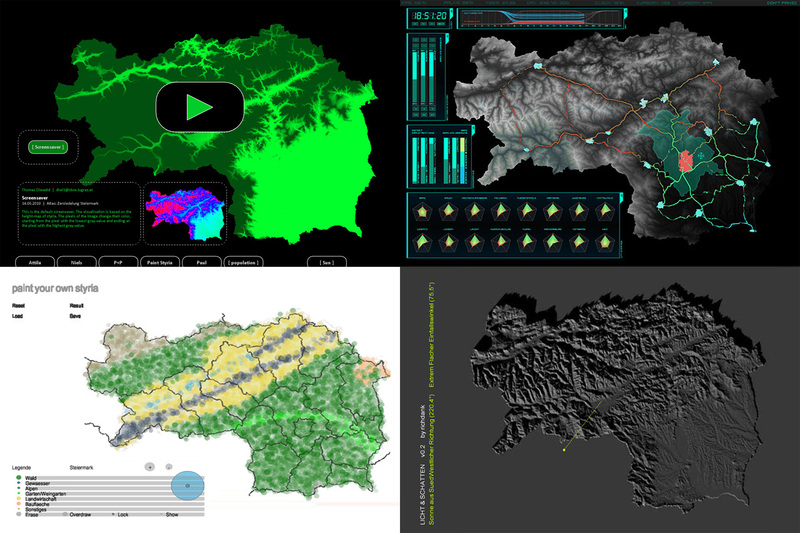 The applications clockwise from top left: Organizer And Screensaver (the default desktop), Commuter Simulator (individual transport), Light And Shade (virtual sun), Paint Your Own (planning scheme). 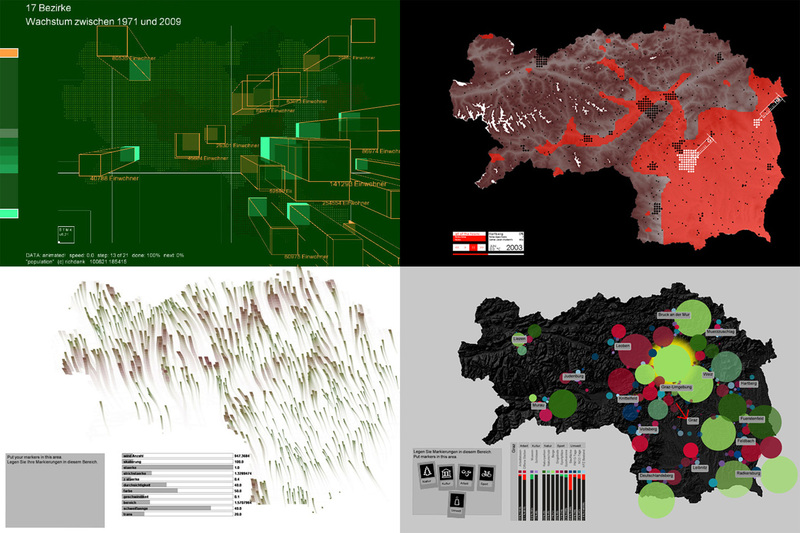 Four more apps clockwise from top left: STMK.v.2010 (population and administration), Ticks (prevalence and protection), Augmented Tourism Tool (where to go, what to do), Wind And Water (renewable energy sources).